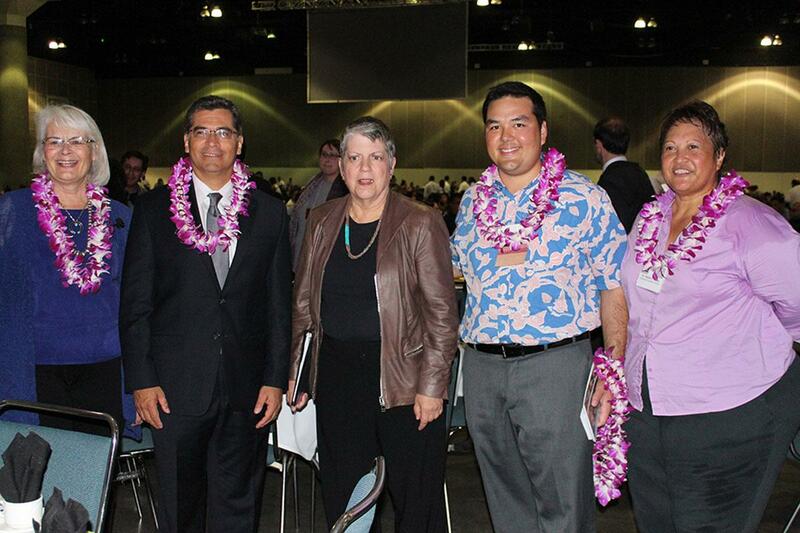 Dignitaries at the 2014 SACNAS national conference in Los Angeles. 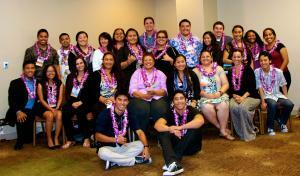 ‘Ilima SACNAS Chapter group photo. With the Outstanding New Chapter Award in tow, 30 members of the ‘Ilima SACNAS Chapter at the University of Hawai‘i recently returned home from the 2014 Society for the Advancement of Hispanics, Chicanos and Native Americans in Science (SACNAS) National Conference in Los Angeles, California. The event was a consortium of over 3,500 student and professionals from numerous Science, Technology, Engineering and Mathematics (STEM) fields. Two UH chapter members won individual awards for their outstanding scientific research presentations: James Murphy (Marine Biology Graduate Student Award, UH Mānoa) and Melanie Keliipuleole (Genetics Undergraduate Award, Kapiʻolani Community College). Conference keynote presenters included University of California President and former U.S. Secretary of Homeland Security Janet Napolitano, and highly regarded scientists. Hundreds of graduate school programs and industry employers from across the country came to recruit top prospects in the SACNAS community of 3,500 attendees. SACNAS is a national organization with 110 college and university chapters around the country dedicated to advancing underrepresented minorities in STEM fields. The local ‘Ilima SACNAS Chapter at the University of Hawai‘i hosts community outreach events, seminars and scientific symposia throughout the year. The chapter is open to all ‘Oahu undergraduates, graduate students, faculty and professionals in STEM. There are more than 100 ‘Ilima Chapter members from UH Mānoa, UH West Oʻahu, Kapiʻolani Community College, Honolulu Community College and Chaminade University. 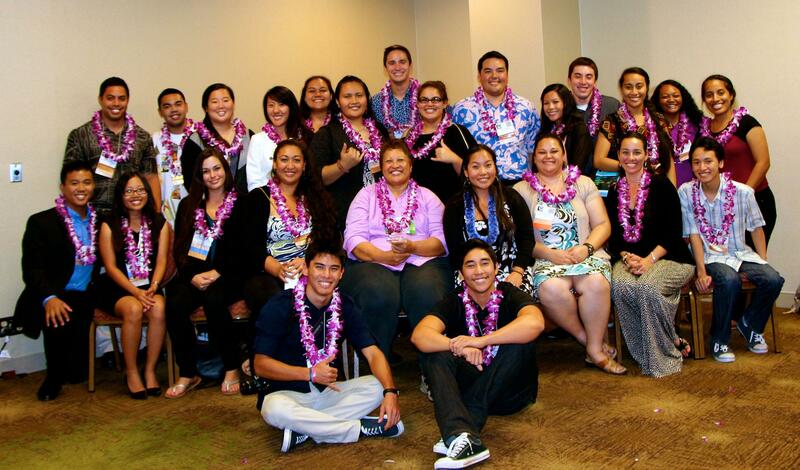 Conference travel sponsors included the SACNAS National Organization and the UH Mānoa Student Activity and Program Fee Board. To become involved with the ‘Ilima Chapter, write sacnas@hawaii.edu or connect on its Facebook page at www.facebook.com/uhsacnas. To view the national SACNAS website, go to www.sacnas.org. (Top photo) From left, SACNAS President Dr. Maggie Werner-Washburne, U.S. Congressman Xavier Becerra (D-CA), University of California President and former U.S. Secretary of Homeland Security Janet Napolitano, ‘Ilima Chapter President Austin Shelton, and ‘Ilima Chapter Advisor Dr. Healani Chang at the 2014 SACNAS National Conference in Los Angeles, California. (Group photo) ‘Ilima SACNAS Chapter members gather after winning the Outstanding New Chapter Award at the 2014 SACNAS National Conference in Los Angeles, California.